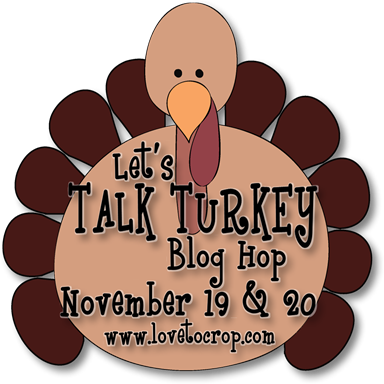 Welcome to DAY TWO of the "Let's Talk Turkey" Blog Hop and..... The Getting Cricky Simply Sunday Challenge!! I'm super pumped that you're back for DAY TWO to enjoy some more TURKEY-FIED creations by some friends and me!! If you missed DAY ONE of the hop, be sure to CLICK HERE for maximum ideas, maximum FUN, and maximum chances to WIN!! I have some SUPER prizes for a few hoppers, so be sure to check out all of those details below!! 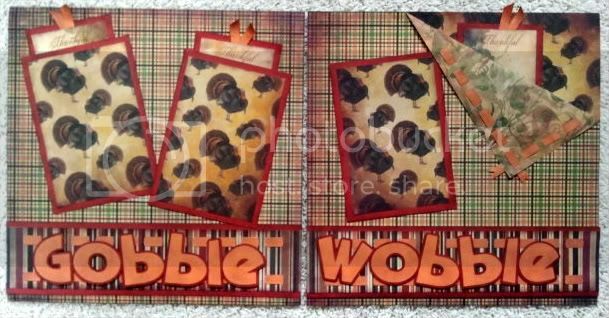 The title for the page was cut from the Robotz Cricut Cartrige (font and shadow features) at 2" from Tangerine Core-dinations paper and Grenadine Bazzille Paper. The background paper is from the Reminisce Harvest Paper Line. Isn't that turkey paper so much FUN??? 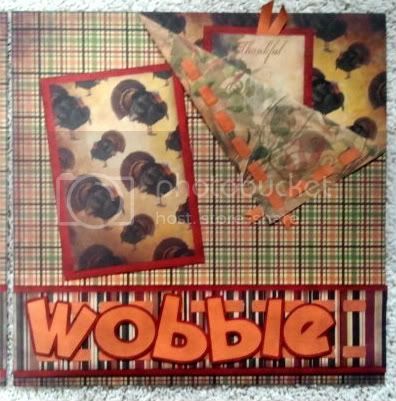 I used the new We R Memory Keepers "Sew Ribbon" tool to punch the ribbon slots on the corner fold and for the strips behind the title... I'm just LOVIN' this tool!! It makes lacing ribbon or paper strips super quick and easy!! :) Tucked in the pocket of the layout you'll see one of the "Thankful" tags that I made for each of us to jot down what we are thankful for on the morning of the run... 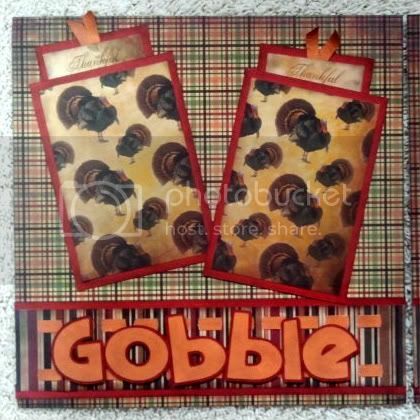 I stamped the "Thankful" with the Fall-O-Ween Stamp Art Set from K Andrew Designs... Isn't that a neat way to remember what was important that morning? Great layout. Super cute! Thanks for sharing. Fantastic layout Amy. I always have trouble with layouts so love seeing them. Love the corner of this one. Sorry you had troubles with the internet this weekend, but it all worked out. Hope you didn't stress too much. Loved all of the projects. Love your layout! Happy Turkey Day! Thanks for sharing! Great layout! It's been fun hopping with you! See, I came back after finishing the 2 day hop because I HAD to see where your post was!!!! I was going to email you, but figured that YOU the Queen of the computer would know how to make it work!! Love the layout, especially the folded back corner with the hideaway tag! Amy, this layout is both fun and beautiful. I love the papers you chose. Good luck with the 5k, I hope you have great weather! I love this layout! What a great job! You always have the coolest designs!! Amy I love this layout, love how you folded the corner and love the title!! Darn you, before I saw this layout I was like "no way do I want that ribbon thing" but now I'm like "OMG that is a must have"!! gorgeous LO. the event sounds so fun. going to have to check back to see the pics added. Fantastic pages! I am definitely loving this blog hop ... so much inspiration! I just finished the hop, joined everyone and even was able to post on everyones today (yesterday there was a glich). I have ideas just blossoming on the brain. 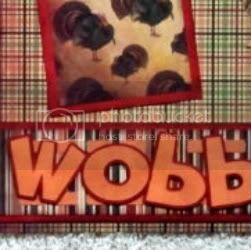 gobble gobble gobble till you wobble!!!! Amy, this LO is fantastic. The paper you used is perfect. Great idea with the tags. Bet the "childs" will love them. You shine with some of the best inspiration out there. Have a great run and be careful. Know what you mean about the rain...it's been extremely windy and rainy here for what seems like days on end. Great Job on the LO Amy! This is great. Have fun in this year's run. What a fun way.to celebrate thanksgiving with your kiddos. hoping for a sunny day for your race. adorable.layout. lots of fun girl! This is a wonderful layout, Amy. 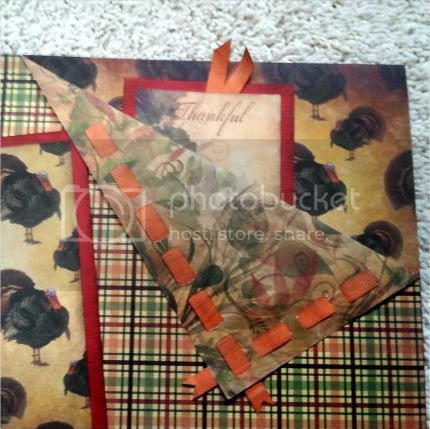 I love the papers and the folded down corner is awesome along with the tags. Amy I hope, no I know you had a wonderful Thanksgiving! I'm sure the kids were home so that makes it wonderful if that were all that happened.